My mother loved to lament, while she was preparing some family feast, that she would have to cook her own funeral dinner. But this was a faux, if not fey, complaint. Sometimes I’d hear it while doing something useful, like peeling potatoes. At other times, I might have been enjoying a late breakfast bowl of cereal, glad to be home and to sleep in. Either way, I went with her flourish. She might have squeaked a bit, but my mother always got things done. If an appliance was going out or a floor needed to be replaced, it would be finished before my next visit. A few months before she died, when she had again been diagnosed with cancer, after 17 years living free of it, she suddenly announced that she was moving into an apartment for seniors. “I want it done, so that you kids don’t have to deal with this stuff.” She gestured around her. She made me go and look at an apartment with her. My mother hadn’t moved since 1960. I don’t think she realized what it would mean. A week later, she had changed her mind. I think that she understood that she had run out of time. Two months later, she was dead. I believe I’ve grieved as much as anyone can. Certainly my faith was a consolation, but there was an additional grace that made a loss, one which I’d had always dreaded, easier to accept. It was the sense that her life was complete, that she had lived well and fully, and that neither she nor I had unfinished business. Would I have kept her if I could? Absolutely! Was she being torn from my life? No, there was a sense that no seams were being ripped. They were all well sewed. Her life was something whole, something complete. In celebrating the Assumption of the Blessed Virgin Mary into heaven, the church draws primarily upon her comprehension of Christ’s resurrection. His crucifixion ripped open his life and that of the universe itself. His resurrection restored both and raised them to glory. the firstfruits of those who have fallen asleep (1 Cor 15: 20). We believe that, because Mary shared fully, and without sin, in the life of grace, which her son and savior brought into the world, she experienced death, the end of her life, not as we do but as we were meant to do. Death for her was a falling into satisfied sleep, the sort one earns when work and cares are complete. There was no tearing, no sense of incompleteness, which marks the death of all others. Life lived under the reign of sin is always incomplete, fragmented, not ready for closure. Death comes as harm rather than as harvest. My grandmother Klein died the night before Memorial Day. Her peonies had been picked and placed in aluminum covered coffee cans, ready to be taken to the cemetery. The chicken was cut and in the sink, ready for the meal that would follow. Death doesn’t come by calendar or clock, but it need not come as thief, as that which robs us of precious time, of opportunities not yet realized. The greatest of saints still die with something that cannot be complete on this side of the grave. Some goodness left undone, some sorrow not yet redeemed and made whole. Not her. Not the Mother of God. for he has looked with favor on his lowly servant (Lk 1: 46-47). The life of her son was violently torn from him—and from her—so that our lives might be made whole in the resurrection. And in the power of Christ’s resurrection, one member of the church, the center of his faith faithful core, ended life as God had always intended: whole, complete, ready for the harvest. No ripped seams. I appreciated this article very much. It puts words to so much about my mother's sudden death. She had harvested her carrots from her plentiful garden and had them all cleaned and ready to eat at the reception following the funeral. The homilist described her death this way: "She went for a walk with Jesus and when it was time to go home, they decided they were closer to His house than to hers so she walked on with Him." Certainly we grieved but in a sense it has always puzzled me why the grief didn't feel catastrophic as I would have expected. Her death was simply "no ripped seams". 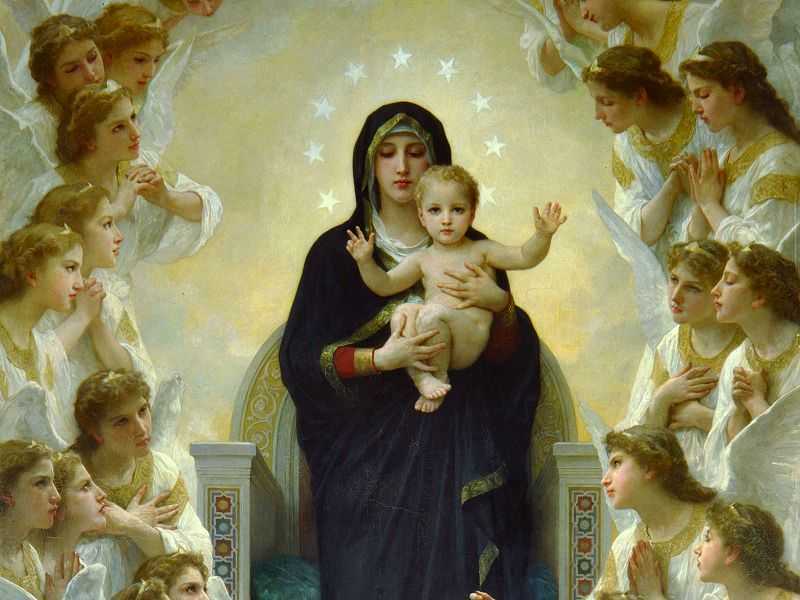 Thanks for this article on the Assumption of the Blessed Mother. This is a good time to reflect on the Promises of the Rosary based on it's frequent recitation and devotion to our Blessed Mother. My daily prayer life never included the rosary; I only said it infrequently. However, after I visited Fatima about 5 years ago I slowly experienced a natural inclination to say at least one decade of the rosary each day. Thanks be to God.